Freedom Checks – SCAM or Legit? Read This Review Before Investing! And whilst there doesn’t appear to be much information on these so-called Freedom Checks elsewhere online, the “official” Freedom Checks website (operated by Banyan Hill Publishing) claims it can show you how to access these funds in return for a small fee. What Exactly Are Freedom Checks? Freedom Checks is merely a term that’s been made up by a company named Banyan Hill Publishing & it refers to the so-called checks that will be getting paid out to American taxpayers through this alleged new scheme. It’s also the name of the website they’ve created through which they promote their “assistance” in obtaining these Freedom Checks (found at freedomchecks.com). At a glance the Freedom Checks website looks fairly legitimate, and the video that you’re presented with on the site seems very convincing. You’re basically led to believe that this Banyan Hill company will help you obtain your “slice of the pie” from the funds that are going to be getting paid out by these designated big-name companies in the USA. Throughout the video you’re also shown several testimonials from people who’ve apparently already received Freedom Checks (which is a little peculiar since according to the website they haven’t become available yet), but nevertheless it appears to be reassuring. Then, on top of that the website itself is also packed full of alleged testimonials too. At a glance all of the testimonials seem amazing, and you’re led to believe that Banyan Hill’s clients are all thrilled after receiving thousands, some even millions of dollars in Freedom Checks thanks to a so-called loophole which was exploited on their behalf by Banyan Hill Publishing. But Is Freedom Checks Actually Real? It’s easy to get sucked into the whole hype of this Freedom Checks thing, and so far it seems many people have. In fact after a guy named Matt Badiali shared the information on these so-called Freedom Checks people have literally been going crazy about it… And who could blame them? I mean who wouldn’t want access to a “free” check that could see you depositing thousands or millions of dollars without actually having to do anything? The problem here though is that it all just seems too good to be true, don’t you agree? And if it’s actually real as it’s made out to be then why hasn’t it been covered by any mainstream media? This alleged “loophole” still remains a secret, only to be known by a small company named Banyan Hill Publishing even after they have apparently successfully helped hundreds of people obtain millions of dollars in free cash. This is where it all gets very, very suspicious. The promise of easy money is one thing, but to actually have to pay money to get access to the easy money is another – this sounds like a classic scam & the whole thing actually looks very similar to one I recently exposed named the Ultimate Retirement Loophole… In fact I wouldn’t be surprised if the two were actually linked. So Who Is This Matt Badiali Guy Anyway? Well according to his own personal website he is supposedly an expert in the mining, energy and agricultural industries. He claims that he has perfected a way of finding profitable investments in natural resources as he supposedly has solid experience as both a geologist & financial analyst. Sadly there appears to be nothing else online that backs up any of Matt’s claims which ultimately leans me towards thinking that he is indeed just spouting a whole load of BS, and that he is just trying to create hype around these checks to get as many people as possible to sign up to his $49 monthly newsletter. Of course though that’s just my own personal speculation, but in my opinion it looks very likely to be the case. You might be thinking though that it would be quite extreme to go to all this trouble, but what you’ve got to realize is that if he can get even just 10,000 people to sign up to his newsletter he will be making a whopping total of $490,000 per year. If he increases that figure to 50,000 people he will be generating an even more whopping $2,450,000 per year, so in reality it doesn’t seem so extreme at all that he would set all this up merely as a ploy to get newsletter subscribers. But I will state once again that this is only speculation based on my experience with similar scams. Another worrying thing though is that if you search for “Matt Badiali scam” you will actually arrive at an article which starts out by calling the Freedom Checks a scam, but then it twists it round and refers you to the Freedom Checks website. It seems like Matt is anticipating people to call his service a scam & he has attempted to cover all bases (which is very odd indeed). Why would you anticipate people calling you out as a scammer if you were in fact legit? Where Do The Freedom Checks Come From? As I mentioned towards the start of this review the Freedom Checks are supposedly to be paid out from “designated entities”. These designated entities, according to Matt, are basically companies working within the natural resources sector (such as oil & gas companies). Matt claims that he has been carrying out historical analysis on these companies & that he is expecting them to see gains of up to 39,832% in the coming year due to the fact the oil production has declined in Middle Eastern countries & has instead remained in the USA due to a recent fracking boom. He states that these companies will be offloading their profits to investors through dividends & that due to the extremely large gains you could potentially see a huge ROI on your stake as an investor. Again, this all sounds a little too good to be true, but the problem here is that even if this all were true it’s still just reliant on guesswork. Nobody can say for certain that a company is going to see such gains because anything can happen – yes you can assume, but that’s all you can do, so even if Matt is telling the truth then these so-called Freedom Checks are by no means guaranteed. My Verdict – Is Freedom Checks a Scam? Here’s the real bummer, unfortunately there’s absolutely no way to tell for certain whether or not this is a scam without signing up for the $49 (or $79) auto-renewing newsletter which honestly is something I’m not prepared to do (because in my opinion it all looks very sketchy). I will say though that without signing up, based on pure speculation in my opinion I believe it shares many common traits to a typical get-rich-quick scam, and even if it’s not the whole thing still relies on guesswork so there is absolutely no guarantee of any “Freedom Checks” coming through even if you do pay the $49 fee. You see the big problem here for me is the fact that you’re promised easy riches yet have to pay to access the “secret”. I mean if this really worked as promised then why can’t our guy Matt just take a cut of the profits handed to you? The reason as far as I can see is because it seems unlikely that you’ll actually be making any money, instead Matt himself will be the guy making all the money & that money will be coming from everybody that’s signed up to his newsletter. Again – it’s speculation, and my personal opinion but that seems to be the real deal here. For those reasons I personally won’t be investing & I wouldn’t advise you to invest either. There are much better, free alternatives available. Real Profits Online – Scam System? My Review Exposes Why It’s NOT Legit! Renegade Crypto Club Review – Is It Really a Scam? I’m Uncovering The Truth! 45 Responses to "Freedom Checks – SCAM or Legit? Read This Review Before Investing!" In reading your opinion of this “offer” & I am disappointed that you did not sign up and try it for yourself before commenting. Yes, I am skeptical. But when I read a “review”, I expect that the reviewer has actually completely tried the product. Hi Nancy, thanks for stopping by & leaving a comment. As I regularly mention on this blog you do not necessarily have to sign up & fall victim to a scam to realize that there’s something untoward going on. After looking at literally hundreds of make-money style programs it’s quite easy for me to see the tell-tale signs of a problematic program & in this instance that’s exactly what I believe Freedom Checks to be. It shows all the signs of a classic “too good to be true” scheme & then asks you to make payment before you can access it – I can you that from experience that’s a major red flag. Many people simply sign up to programs like this without a second though & as a result they get burned, the intent of my review is merely to make people stop & think about what is really going on here with this program, then, given the information they have received they can go on to make their own informed decision as to whether or not they really want to join knowing the potential risks of doing so. The big question – if people pay him, and he delivers nothing, can we not legally do a huge class action suit against him? Please reply! Any lawyers there?? Thanks. Hi Kevin, my answer from what I’ve seen with other scams would be no. The reason being because you’re essentially just paying to sign up to the newsletter & the newsletter is delivered as promised so essentially in legal terms your purchase has been fulfilled… This means that sadly even if the information provided to you is totally useless, the creator of Freedom Checks will likely still be able to get out of refunding you (sadly). That’s why I personally believe it to be way too big of a risk, especially with how overly hyped up the whole thing seems. Jim Rickard’s Daily Reckoning offered the same thing by subscribing to HIS newsletter. The two guys must be in kahoots with eachother or trying to make it sound ligit by “spreading the news of this founded wealth”. Awesome that you noticed that, thanks for pointing it out… Makes it look even more suspicious! I looked this Freedom Check thing on Snopes. The page didn’t go to Snopes at all. It was all about hyping the checks. So it appears even more likely that this is a scam since it looks like Banyan Hill has hi-jacked Snopes. Really? Wow thanks for pointing that out. Definitely sounds suspicious! Why do all the graphs with big returns have dates from 2010-2008… nothing current. Another good point that certainly raises my suspicions even further. Is this the same site that advertises on the radio which tells you that there is $34.6 Billion out there waiting for you? I haven’t heard the radio advert but it’s likely to be the same site as the site I reviewed makes similar claims. Seems like a continuing soap opera to me if you have to pay $49 every month. Why couldn’t the “secret” be revealed in the first and only issue? Haha I enjoyed that comment, but yes you’re absolutely right. 710 WOR in NYC all afternoon. Got a George Bush sound-a-like. Freedomchecks, get yours… I did go there, and the presentation is quite long. Quite suspenseful and quite obvious. Thanks for your observation. He did not even get the name of the Houston Texans owner right. I’ve been hearing it on a Garden City, Kansas radio station almost every day. Don’t know the call letters but I’m listening to Sean Hannity when it comes on at 3:00 p.m. Been hearing it now for a month or better. Decided today to check it out. Sent my son the link to listen to it and he said to Google AARP but didn’t find anything there so clicked on this link and glad I did. Thanks, Dale. Like you said, “If it sounds too good to be true, it probably is too good to be true.” “A sucker is born every minute”. Haha!! Every time I start to leave the page, there a page that jumps out asking if I really want to leave the page now!! 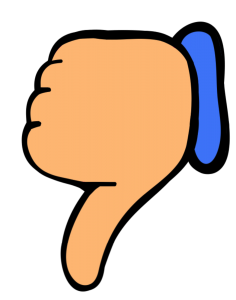 Dale – if you are in the UK you will not hear the 30 second commercial that the previous comments refer to. But the 30 second piece features a male voice with a distinctive “southern redneck” drawl which attracts those that regularly listen to programmed conservative talk radio stations in the US and which are marketed to a certain demographic segment in the US espousing “freedom” (primarily from alleged “liberal” government policies and for personal fiscal prosperity in exchange for nothing), anti-government rantings, and serving as a voice for the “forgotten” American (namely the white lower middle class, undereducated, rural, minimally skilled labor force hoping for a “savior” to “Make America Great Again”). Banyan Hill skillfully identified this demographic group to market the concept of “freedom checks” and it has been proven to be quite successful here in the US. They have purchased many 30-second slots during daytime hours only (as many in this demographic is not employed during regular working hours) throughout selected radio markets in the US targeting this group with the lure that they will receive this “freedom money” for nothing. it is herein that the scam takes place. One must give kudos to Banyan Hill for a successful radio marketing campaign. Dale, you are correct that this is a scam and should be stayed away from. If, as the radio commercial states, one truly wants to find “freedom”, then Badiali could have simply revealed his selection of companies expected to increase their earnings dramatically resulting in dividends to its shareholders (“freedom checks”) and let investors take their chances in the capital markets. Sorry for the length but I hope this illuminates better the issue surrounding the “freedom checks” frenzy. One thing I also noticed is that the date listed on their website changes month on month. 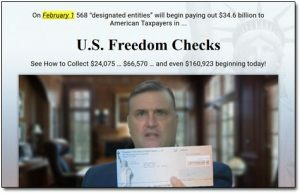 When I originally published the review in January we were given a heads-up about these so-called Freedom Checks coming on February 1st… Now that we are in February surprise surprise the date has changed to March 1st. All very suspicious! If the whole thing was quite as legit as it was made out to be then I’m sure such marketing tactics wouldn’t be necessary. Thanks for your comment though. Thank you for a very informative and honest review. Like many others I was very intrigued by the radio ads I was hearing on talk radio, which most listeners are inclined to trust. The primary red flag for me is exactly what you said in your response to Robert’s great post. I had been listening to the ads for over a month mulling it over and doing some research, when I too noticed the date change. The ad says that you “must act quickly” because the opportunity to get these checks will be ending by..and it was the first of the coming month, reinforced by the notion that you will miss the boat if you don’t act quickly (talk about the classic used car salesman). A few weeks later the same ad on the same station had the end by date moved up one month. along with the website being changed slightly so they could track by date heard, not station heard on because that code would not need to change. These are all HUGE red flags. Keep up the good work. People like you who are willing to help by sharing their knowledge for the benefit of others are to be commended. I’m looking for truth and accuracy in my research on these Freedom Checks that seem too good to be true. Yours is the only place I’ve found so far that is addressing this. But you don’t seem to have your facts straight. The subscription is yearly not monthly with an automatic annual renewal fee of $79. They also state that they are an investment guide and the size of the check will depend on what you invest and that the checks are recurring. So that would explain the changing dates. More in depth analysis would be appreciated. Hi Brenda – you’re right, that’s because the website has seemingly once changed again & now after hitting the button to find out more you’re redirected to the sales page of the Real Wealth Strategist. The cheapest version of this is currently $47, however it actually renews at $97 and it’s possible you’ll also be charged for the renewal of the Bauman letter too which costs $79 as a 3 month trial of this is included with the whole package. Basically what you’re buying here overall is investment advice, it’s not the worst thing in the world but I think the way they’ve marketed it via Freedom Checks as “free money” is pretty misleading in my opinion. The date has changed to April 1. They advertise incessently on the radio so must have fairly deep pockets. Thanks for your insight. Also known as April Fools Day – maybe it’s all a big joke LOL. It may not be a scam but they are sure good at bait and switch! They promote one price ($79) and then end up trying to charge over $2500, not once but twice!!!!! Stay away from it. Really? Wow I wasn’t aware of that – thanks for pointing that out. I’ve known of several other programs doing similar things though, luring people in with small fees then pushing super high-priced things on them once they’re in, promising that the extra investment will help them make money quicker & easier… As you can imagine it never usually turns out to be any good. 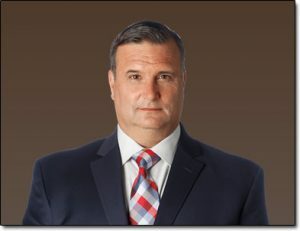 Dale, it appears that Freedom Checks are dividends paid by Master Limited Partnerships (MLPs) in the US oil, gas and gas/oil transmission (pipeline) business. I listened to part of Matt’s endless spiel and one thing he said is a true red flag, i.e. that some of the checks could also be a “return of capital.” That happens when a dividend is composed of a part of the company’s free cash flow and a part of the shareholder’s equity. You see that when the dividend is $1.00 and the value of the share drops from $10.00 to $9.50. You can lose much of your investment this way – hardly “free cash.” You can find oil/gas MLPs for free by Googling “Energy MLPs.” But investors should definitely check out the tax implications first to make sure it fits with the type of their brokerage account. Can I get $49.00 for revealing Matt’s secret sauce for free cash? Awesome comment Jennifer, thanks for the insight – and LOL! As one of the other commenters mentioned it seems they’re apparently charging a LOT more than $49 behind the scenes for access to this information… The commenter (Rhonda) mentioned they were asked to fork out around $2,500… Shocking! Thank you Dale. As I have just viewed the online ad. I was taken in by the charming man telling me I could make thousands of dollars a month. Almost signed up right then. But as a retired Pawn Shop Manager of 30 Years the old saying goes “A fool is born every moment” “A fool and his money are soon parted” “If it sounds to good to be true it is” I stopped to do my own research to see. And found you. Thanks for stopping me make a huge error in judgment. Sounds like a close call! And you’re dead right when you say if it sounds too good to be true it probably is… That’s a saying I regularly stress on this blog. 🙂 Thanks for leaving a comment. The last time I got this stoked over an investment infomercial was for the Bitcoins, what ever became of Bitcoins? Bitcoin is still alive & kicking but the amount of scams launching off the back of it is unbelievable. Yes, anonymous speedy transactions may have some legitimate uses but honestly week after week I’m exposing more & more cryptocurrency Ponzi schemes… It’s crazy. I don’t know anything about the Freedom checks investment but I do know about Banyan Hill publishing. They have several investment advisory services that are legitimate and very good. I am a subscriber to three of their services and am making a nice profit in the stock market (from each service) for the first time ever. So far my gains have more than paid for lifetime subscriptions and and am way ahead this year with no more payments due ever. Their effective services are not cheap but I covered the entire cost with profits from just one stock recommendation. I am not a subscriber to the “freedom checks” service so I will not make any comment on it. Banyan Hill, however, is worth a look. Thanks for the comment – it’s just a shame the way they choose to market their investment newsletters. This whole “Freedom Checks” thing could have been put forward in a much better way, as it stands it’s just way too hyped up for my liking. Not to mention the fact that one of the people who left a comment reported that Banyan Hill tried to squeeze an additional $2,500 out of them on top of the newsletter fee. Obviously I can’t personally verify that, but I sure don’t like the sound of it. There is no way to verify these folks receiving these so called lump sums of money and have no way to verify their veracity. This guy is a gas bag and trying to over sell. Very sceptical! Why would this guy want to share his secrets and spread the wealth. I agree – the overselling was what made me very sceptical about it all too. There have been so many scams that my initial reaction is: as soon as I hear/read ‘for a nominal fee’ or any other mention of ME sending money first – delete & desperately try to unsubscribe. Funny thing was that I wasn’t able to access the publisher’s website – in case anyone is wondering why the reason is because of a $49 upfront fee. Yep I agree with you. I mean sure, there will be some instances where an upfront fee is legitimate – but the only way I would personally pay a fee is if everything was clearly explained prior so I knew exactly what I was paying for & what I would be receiving. If they’re keeping anything “secret” until you pay the fee then yeah, it’s much likely a scam. Its been a while since my last port to you on Feb 22. Just to catch you up on the latest, the deadline date was just changed yesterday to May 1. In my opinion, this means that either: 1)They have not yet been able to reach their desired subscription numbers for suckers buying into their program, or 2) They have some very deep pockets in setting up a new marketing campaign using the same pitch and same materials (the only change – there is a new voice on the ads; a more Midwestern voice but with the same script). Thought you would be interested in hearing this. Thanks for the update – interesting to hear that they changed the voice on the adverts, maybe they’re now trying to target a new audience. I also just heard a new “Freedom Checks” radio ad, which radio alerted me to this “promotion” in the first place, has an edited audio insert revising the previous April 1st Deadline, to, now, May 1st. If there had been a real deadline, how could the deadline date slide ? Yep exactly – in my opinion it just sounds more like a false scarcity tactic. It’s absolutely amazing how these people can appear so real and down right so sincere! Yes my wife signed on thinking rather both of us thinking we were on towards something big but good not at least suspicious of being scammed by some lying behind thief with a suit on sounding so professional and assuring to anybody who would take the timeout to listen to these lies!! To me those Freedom Checks are not real, they are like pipe-dreams into thin air so everybody listen up don’t fall for it and become the next victim of this scam……..